Special Containment Procedures: SCP-2041 should never be allowed to be handled by anyone with military ties or who otherwise has means to acquire tanks. Description: SCP-2041 is what appears to be a standard rotary platform used to maneuver tanks while measuring infrared radiation. 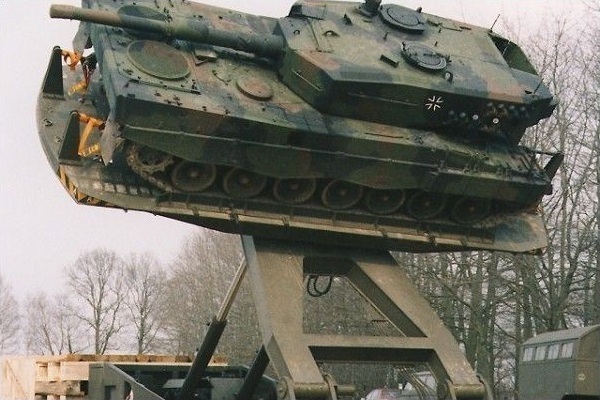 In reality it is a high-powered catapult capable of launching tanks long distances. This serves no practical military application, as any tank launched in this manner is critically damaged upon impact. SCP-2041 has also exhibits a psychological effect on anyone who comes in contact with it or learns of its nature. Those affected exhibit an unwillingness to destroy it, citing "how cool it is." In addition to being unwilling to destroy SCP-2041 subjects are prone to an obsessive desire to use it. Fortunately, subjects are only willing to use tanks and will deride any suggestion of alternative ammunition. When the subject has any sort of combat field experience, they will list off theoretical applications that range from the almost practical to outright ludicrous. Addendum: Any requisition form involving tanks sent from Site ██ are to be immediately denied. Transport of any tracked vehicle to Site ██ without permission from an O5 will result in immediate punishment. See Document 2041-J for more information.